New! 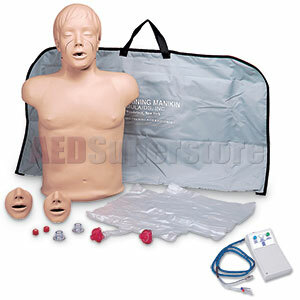 Specialized item for training of CPR. CPR Brad with Electronics provides the CPR trainee with feedback of their hand position, depth of compressions and ventilations. Brad's realistic appearance, accurate anatomical landmarks, and individual-use mouth/nosepieces with disposable airway/lung system and non-rebreathing valve combine for function, durability, and ease of use. The convenient nylon carry bag can also be used as a kneeling pad when empty. Proper hand placement on the sternum - When a hand is placed on the chest in the correct position, a pressure plate under the overlay skin is compressed, closing a circuit to illuminate the “hand position correct” light. Size: 28" x 18" x 10"